I was meant to give a talk on the life of Elijah at a meeting not so long ago, but the meeting ended up being cancelled, so I thought maybe it might be a good idea to write my thoughts on here and maybe some of us can benefit from them. Elijah was quite a character. 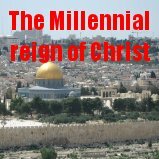 He was a unique individual that was used by God to bring His people back to Himself during an especially dark period in Israel's history. We are told in Scripture that Elijah was a man of like passions as us (James 5:17), and so as Christians there is a lot that we can learn from his life, and from the difficult circumstances that he often found himself in. A number of months ago I was feeling very discouraged and depressed. There are very few people in my assembly now. My grandfather recently went to be with the Lord, and I am the only young person left in the meeting. And I started to feel down, and to imagine how Elijah must have felt when he complained to God that he was the only one left. And so I started to think about Elijah and the places he visited, to understand more about the man, his faith in God, his struggles, his discouragements and his ultimate restoration. I started with Elijah's name. In Hebrew it is pronounced Eli-yah-hu, and literally means, 'My God is the Lord'. 'Eli' means 'My God', and 'Yah' is a shortened version of the name of the Lord. I was thinking that the meaning of Elijah's name, as is the case of so many other names in the Bible, is extremely significant. For instance, the name 'Adam'. It is interchangeable with the Hebrew word for 'Man', and comes from the same root word that means ground, 'Adamah'. The name 'Eve' or 'Chavah' in Hebrew, is translated as 'life-giver', and being the first woman that God created, this is extremely significant. There are many other examples of people with significant names in the Scriptures, for example, 'Abram' means 'exalted father', and his name was later changed to 'Abraham' (Genesis 17:5), which means 'father of a multitude', a prophecy of a future day when God would multiply Abraham's seed. 'Isaac' or 'Yitzchak' in Hebrew means laughter (Genesis 21:6), and God's promise that He would give Abraham and Sarah a son in their old age would cause them to rejoice with laughter. 'Jacob' or 'Yakov' in Hebrew means 'supplanter' (Genesis 21:36), and he tricked his brother out of his birthright and blessing. David was a man after God's own heart (Acts 13:22), the heart of a shepherd (John 10:11), and it is therefore significant that his name should mean 'beloved'. The name 'Jonah' or 'Yonah ben Amittai' in Hebrew means 'dove' and 'the son of truth'. The prophet was sent to Nineveh to bring them a message of God's peace, if they would repent of their sins. This reminds us of that Scripture, "Mercy and truth are met together, righteousness and peace have kissed each other", Psalm 85:10. You can't obtain mercy from God without first acknowledging God's truth that you are a sinner. And God has provided a way whereby He can can show the sinner mercy, yet still be righteous, through giving His own Son Jesus Christ to bear the punishment of our sins in our stead (John 1:29). And of course the name 'Jesus' or 'Yeshua' in Hebrew is no less significant, as it means the salvation of the Lord (Matthew 1:21). It is only through Yeshua that we can obtain God's salvation. So as you can see, the names of people in the Bible are of the utmost importance, and can teach us a lot about the character of a person and the role God has for them to perform in His will. As we have said, the name 'Elijah' means 'My God is the Lord', and that statement seems to come to the fore throughout his life and the different circumstances he finds himself in. Ahab was ruling over the northern kingdom of Israel at that time. He was one of Israel's most wicked kings. His name in Hebrew, 'Achab', means 'a friend to his father'. It was said of his father, Omri, that he did more evil than all the kings who had come before him (1st Kings 16:25). And in that, it seems, Ahab truly was a friend to his father, for it is also said of Ahab that he did more to provoke the Lord to anger than all the kings who came before him (1st Kings 16:33). It was through Ahab and his wife Jezebel that many of the true prophets of God were slain, and he raised up an altar to the false god Baal in Samaria. It was to this king that God sent Elijah to deliver a message of impending judgement. We are told in the book of James that Elijah prayed earnestly that it might not rain, and for the space of three and a half years there was a massive drought in Israel. Only when the heart of the people was turned back again to Himself, the Lord would show mercy in sending the rain. This truth of God set Elijah in direct opposition to everything that Ahab stood for, and as a result Ahab sought to have Elijah killed. It should be the same for us today. The message of the Bible sets us apart from the world. Christ is a divider of men, for as He said, "I am come to set a man at variance against his father, and the daughter against her mother, and the daughter in law against her mother in law", Matthew 10:35. So Elijah was forced to flee for his life. But the Lord was taking care of Elijah. The Lord instructs him to flee, and turn eastward, and hide by the brook Cherith. There he would drink of the brook, and there the Lord had commanded the ravens to feed him (1st Kings 17:3-6). I had the privilege of being able to see this brook during my last trip to the holy land. There is a photograph of the brook on the right. It was especially nice for me being there, as I had done this study on the life of Elijah prior to coming here, so it had a special significance for me. The brook is not too far outside the city of Jerusalem, but it is still in a desert place. The word 'Cherith' in Hebrew means a 'cutting' or 'separation'. It could be that the brook got its name for the way it cuts through the land. But for Elijah, this was a place of separation. He was physically separated from the nation of Israel, and he was spiritually separated unto his God. That is what the word sanctification means. It means to be set apart unto God for a special purpose (Exodus 13:2. John 17:17,19). It was here, during this time of testing, that Elijah learned what it meant to depend on God. And it was here the Lord showed Elijah that He was Sovereign, even over the creatures that He had made. As the Lord said in the Gospels, not one sparrow falls to the ground without the Father knowing, and yet He cares for us much more than He does for the animals (Matthew 10:19-31). So God cared for Elijah. Sometimes we go through circumstances in our lives where we are separated from the world, either through sickness or difficult circumstances. But it is during those times that we are able to experience God's care for us in a way we never did before. Thinking about the 'cutting' aspect of Cherith, sometimes in the Middle East you will see groves of Olive trees, and they may appear to be hacked down to the ground until only a stump in the ground remains. You might think to yourself, how could that tree ever grow again? But it does. And the cutting is necessary to produce a greater yield of fruit in the coming harvest. When the Olive tree is cut down, it sends forth new shoots out of its roots. That reminds us of two Scriptures. The first in Job 14:7, that there is hope for a tree, when it is cut down, that it will grow again. This was true in the life of Nebuchadnezzar, king of Babylon, who was cut down by God because of his pride, but grew again after he humbled himself (Daniel 4). It also reminds us of the prophecy concerning David and the coming of the Messiah, that the Lord Jesus Christ would be a Branch that would spring forth out of Jesse's roots (Isaiah 11:1). Sometimes in our lives we depend on people and things rather than depending on the Lord for our needs. And sometimes the Lord will cut away these things from our lives, so that we will learn to depend on Him instead. As the Lord said, "Every branch in me that beareth not fruit he taketh away: and every branch that beareth fruit, he purgeth it, that it may bring forth more fruit", John 15:2. If you are going through a time of purging, be glad, because the Lord intends it for your good. The Scriptures tell us that the drought caused the brook to dry up, and so Elijah is forced to move on once again (1st Kings 17:7). But this is a divine drought. He is only passing through what the Lord has already decreed should happen, so the Lord must be able to meet his need, even in this wilderness. And so the Lord sends him to a place called Zarephath, a city that belonged to Tyre and Sidon, north of Israel. And again the Lord displays His sovereignty over His creation, when He declares that He has commanded a widow to sustain him there. But how could a widow, who has no form of income nor means of support, possibly sustain herself never mind anybody else? The Lord did not explain to Elijah at this time how He was going to sustain him. But Elijah had faith that the God who had brought him thus far would not fail him now. The word 'Zarepath' in Hebrew means 'refinement'. And it was here that the faith of the widow was refined in the furnace of affliction. The drought had hit Sidon too, and when he met the widow, she was gathering two sticks with which to cook the last meal for her and her son. It is interesting to note the widow's increasing revelation of the God of Elijah. The first time she addresses Elijah in reference to the meal, she says, "As the Lord thy God liveth", 1st Kings 17:12. Either she was not personally a believer in the God of Elijah, or she no longer believed in Him. Perhaps due to the circumstances of her husband's death, or perhaps due to the famine and their own impending deaths, she had lost faith in God. But Elijah declares that the God of Israel says her barrel of meal will not run out, nor will her cruse of oil fail, until the day He sends rain on the earth (1st Kings 17:4). While this was nothing less than a miracle, we are not told that it affected the faith of the widow and her son to a great extent. It would take something that comes much closer to the heart to cause her to turn to the God of Elijah. It would take the death of her son. Her second address to Elijah was as a 'man of God'. She now recognized the God of Israel to be the true God, for she asks whether Elijah has come to call her sin to remembrance through the death of her son. We are not told what her sin was, but clearly it bothered her and it was this that prevented her from trusting in the God of Elijah and separated her from a relationship with God. The Scriptures do tell us that God will call to remembrance the sin of those who have not had their sins forgiven through believing on the Lord Jesus Christ for salvation (John 8:24). And God requires that which is past (Ecclesiastes 3:15). Of course Elijah intercedes to God on behalf of the widow. And for the second time in the chapter, he asks her to give him something first. The first occasion was when he asked her to make him a meal first, and then make for her and her son. That was to test the widow woman's faith, whether she trusted the word of the Lord fully or not. For all that she had would only suffice to make a meal for her and her son. The second time Elijah asks her to give him what is closest to her heart. "Give me thy son", he says. Once again her faith was being refined. Elijah prayed, and the soul of the child came into him again. And the widow said, "Now by this I know that thou art a man of God, and that the word of the LORD in thy mouth is truth", 1st Kings 17:24. The question is, did she not know it before? What about the barrel of meal? That didn't touch her heart, but this did. And look at what she says, the word of the Lord in your mouth is truth. It was no longer the 'God of Elijah'. It was no longer the 'God of Israel'. She calls Him Lord, which shows that she has trusted Him herself. What can we learn from Zarephath? The Lord also demands first place in our lives. As the Lord said in Matthew 6:33, "But seek ye first the kingdom of God, and his righteousness; and all these things shall be added unto you". May the Lord help us to not depend upon the fickle things of this world, but to depend solely upon Him, and to put Him first in our lives. Three years would pass before the Lord would speak to Ahab again. And the Bible tells us that the famine was severe in Samaria. King Ahab sent his servant Obadiah to find grass for the horses, so they might not die because of the drought. We are told that Obadiah was governor over the king's house, and that he feared the Lord greatly. Obadiah's name in Hebrew, 'Obadyahu', means 'servant of the Lord'. The word 'oved' in Hebrew means 'work', and from it we get the Hebrew word for servant, 'ebed'. Despite being a servant to the wicked King Ahab, Obadiah recognized that he also served a greater King, the Lord God. And he feared this King much more than he did Ahab. For when Ahab's wife, Jezebel, sought to slay the prophets of the Lord, Obadiah hid one hundred of them in a cave and fed them with bread and water. He risked his own life in disobeying his earthly master for the sake of pleasing his heavenly one. And this reminds us that despite being subject to earthly masters (Ephesians 6:5-9) and governments (Romans 13), which do not always act in ways that are pleasing to God, we serve another King, one Jesus (Acts 17:7). And while we are to give our earthly masters the respect due and be subject unto the higher powers, everything that we do must be honouring to God who has the greater authority (Acts 5:29). So Elijah meets with Ahab. And Elijah requests that the king gather all Israel to Mount Carmel, along with the four hundred and fifty prophets of Baal, and the four hundred prophets of the groves, to prove once and for all which is the one true God. Mount Carmel is not a single mountain, but a mountain range spanning over twenty miles in the north of Israel. The word 'Carmel' means 'fruitful' in Hebrew, and spiritually this was the fruitful period of Elijah's life. That is not to say that the previous periods in Elijah's life were any less important. They were necessary to prepare Elijah for this time of trial, and to prepare the hearts of the people for turning back to God. He reminds us of that 'Elijah' of the New Testament, John the Baptist, who was sent to prepare the nation of Israel for receiving their Messiah (Luke 1:17). The Lord had brought Elijah through the period of cutting and separation and through the years of refinement. And the people of Israel now had nobody else to turn to. The king had been unable to ease their distress. And their false god Baal would not answer their prayers. The time was ripe for bearing spiritual fruit. And so Elijah challenged Ahab and the prophets of Baal. I'm not going to say much about the two sacrifices, but what I will say is this. Look at Elijah repairing the altar of the Lord. He builds an altar "in the name of the Lord". That is significant when we remember that the name of the person who is building the altar is Elijah. Remember at the start we said his name meant, 'My God is the Lord'. So here we have Elijah fulfilling His God-given role in life. He is living up to the meaning of his name. And once again, when the fire falls from heaven and devours the sacrifice, the stones, the water and the dust, the people of Israel declare, 'YHWH hu HaElohim', or, 'the Lord, He is the God'. The people recognized that Elijah's God truly was the Lord. This should be a great example for us. What does your name mean, and are you living up to its meaning? Are you fulfilling the unique purpose and plan that God has for your life? It's interesting to note that even though the Lord told Elijah that He was going to send rain on the earth, way back before he even met Ahab again (1st Kings 18:1), the Lord does not send the rain until after Elijah's sacrifice on Carmel. It's almost as if the promise of rain is purposely withheld until the hearts of the people have turned back to God. And God's promise also seems dependent on Elijah's earnest prayer for rain. There are a number of lessons we can learn from this. Spiritually speaking, the true blessings of God such as the forgiveness of sins, can only ever follow sacrifice. God would not be righteous if He permitted sinners entrance into heaven without first judging their sin. It is only through the sacrifice of the Lord Jesus Christ upon the cross of Calvary that we can obtain the forgiveness of sins. Christ bore God's judgement for our sin upon the cross (Isaiah 53:6), and when we accept Him as our Saviour, like the people in Elijah's day we can have forgiveness and come into a right relationship with God. And why did Elijah have to pray for rain? After all, it was the will of God. God had already promised to send the rain. And why did Elijah have to persist in prayer, even seven times, before he saw any results? Although God can work divinely in our lives without us having to pray, God desires us to pray, and delights to answer the prayers of His children (Isaiah 65:24). We pray in faith, believing that God will answer our prayers. And faith pleases God (Hebrews 11:6), because we are showing that we trust Him and believe His promises, and that brings glory and honour to Him. May the Lord help us to live up to our names as Christians, and seek His face and pray that His will be done in our lives. When Jezebel had heard how the prophets of Baal had been slain, she was livid, and signed Elijah's death warrant promising that he would meet a similar fate as theirs within twenty four hours. The one that had orchestrated the slaying of the prophets of the Lord was now on the receiving end of God's justice, and her unrepentant heart would ultimately seal her own fate. As the Scriptures say, "Vengeance is mine; I will repay, saith the Lord", Romans 12:19. And in Hebrews 10:31, "It is a fearful thing to fall into the hands of the living God". This should be a warning to those who have not yet trusted in Christ for salvation. The Lord Jesus Christ declared that "every idle word that men shall speak, they shall give account thereof in the day of judgment", Matthew 12:36. While it may appear that the wicked often escape true justice at the hands of men, the day of God's judgement is coming. Despite having witnessed such a miraculous victory upon Mount Carmel and the restoration of the heart of the nation of Israel, Elijah's courage fails him and he flees for his life. The period of spiritual fruitfulness past, Elijah now enters his wilderness experience. This is the only occasion in Elijah's life where he goes somewhere the Lord has not told him to go. But even though he did this the Lord was still with him, although he would have to make the return journey for his troubles. He travels over 80 miles south to Beersheba, and then another day's journey into the wilderness, where he sits down under a juniper tree and requests that he might die. But his request is not granted. He is not told the reason why at this time, but he would find out why later on. Sometimes in life we pray for things that are not in the will of God for our lives. We are not always told the reason why our requests may be denied. But we can be sure that the Lord always has our best interests at heart, for "no good thing will he withhold from them that walk uprightly", Psalm 84:11. And sometimes, as was the case when the answer to Elijah's prayer for rain seemed to be delayed, it may simply not be the right time for the Lord to give us the desires of our hearts. It is important therefore to wait on the Lord's timing, for "He hath made every thing beautiful in His time", Ecclesiastes 3:11. And so the Lord sends an angel to strengthen Elijah. When he is wakened, there is a cake baking on coals and a cruse of water at his head. And twice the angel tells Elijah to rise and eat, for the journey would be too great for him (1st Kings 19:6-7). After he eats and sleeps, he travels for forty days into the desert to Mount Horeb, the mount of God. The word 'Horeb' in Hebrew means 'desolate', and this proved to be a very desolate time in Elijah's spiritual experience. We are not told why Elijah chose to go to Horeb. The Lord hadn't sent him there. But Horeb was the place where the Lord had appeared to Moses in the burning bush following his wilderness experience (Exodus 3:1-2). Perhaps Elijah thought that if he was to get answers to his problems, this was the place where he would find them. Perhaps he thought the Lord would appear to him as He had appeared to Moses, and would give him further instructions as to what he must do. Perhaps he just wanted to get as far away from Jezebel as possible. Whatever the reason, he soon finds himself living in a cave on the mountainside. There is something about living in a cave that conveys a sense of absolute destitution and despair. The Bible mentions several other occasions where people dwelled in caves, and none of them seem to have had uplifting or encouraging experiences while there. Lot and his two daughters dwelled in a cave following the destruction of Sodom (Genesis 19:30). David hid from King Saul in the cave of Adullam, "and every one that was in distress, and every one that was in debt, and every one that was discontented, gathered themselves unto him; and he became a captain over them:", 1st Samuel 22:2. And Saul's experience in the cave also proved to be to his detriment, when he almost lost his life through his carelessness (1st Samuel 26:10). So Elijah has now come to the lowest place in his spiritual experience. And the Lord asks him a question, "What doest thou here, Elijah? ", 1st Kings 19:9. You might think to yourself, that is a very strange question to ask. Did the Lord not know what Elijah had been through? Did He not care? He did care. But the Lord words the question in such a way as to get a specific response from Elijah. And Elijah misunderstands the question completely. He replies that he has been very jealous for the Lord, and how the nation of Israel has cast down His altars, broken His commandments and killed His prophets. And to cap it all, now Jezebel is seeking to take away his own life. Things couldn't get any worse. But if you notice, Elijah never answered the question. The Lord already knew all about the nation of Israel and Jezebel. The Lord wanted to know what Elijah was doing there, for He had not sent him to Horeb. In a very gentle way, without minimizing in any way all of the trouble and anguish Elijah has been through, the Lord is wanting him to get past all the hurts and disappointments and circumstances of life, and to focus again on Himself and the work He has for him to do. But because Elijah did not comprehend what the Lord was trying to do, the Lord must ask him a second time. The Lord tells Elijah to stand before Him on the mountain. And a mighty wind passes by the mountain and breaks the rocks in pieces, but the Lord was not in the wind. And after the wind, a great earthquake, but the Lord was not in the earthquake. And after the earthquake a fire, but unlike His appearance to Moses so many years ago, this time the Lord was not in the fire. And after the fire, a still, small voice. And the voice asked the same question again, "What doest thou here, Elijah?". But Elijah still does not understand the question, and so repeats his previous complaint. This should be a lesson to us. Sometimes we think that God is only working in our lives when we can perceive it ourselves. That is not always the case. Job couldn't see God at work, even though he knew He was with him (Job 23:8-10). And Elijah didn't know that God had reserved 7000 men who had not bowed their knees to Baal. He thought he was the only one left. God is at work, but it is up to us to have an open ear so we will hear what He would have us to do. Another thing we need to remember is, sometimes when we go through difficulties in our lives we may expect God to answer our prayers in a certain way, rather than according to His own will. God may choose not to work through the miraculous in our lives, like the wind, earthquake and fire. He may choose to use the 'still, small voice', to work through the ordinary and mundane things in our lives. We shouldn't despise that. And so the Lord tells Elijah what to do. He is to go north to Damascus, back the way he came, and anoint Hazael to be king over Syria. The word 'Hazael' in the Hebrew language means 'one whom God sees', or 'God has seen'. And this shows us that God had seen all that Elijah had been through. He sees the hurts, the disappointments, the difficulties in our lives. He sees. But He doesn't want us to focus on that. He wants us to focus on Himself. And then He asks Elijah to anoint Jehu king over Israel. The word 'Jehu' in Hebrew means 'He is the Lord'. And this reminds us again of the meaning of Elijah's name, and how that the Lord is able to meet our needs, because 'He is the Lord'. "Is any thing too hard for the LORD? ", Genesis 18:14. And finally He asks Elijah to anoint Elisha, the son of Shaphat, to be prophet in his stead. The name 'Elisha' in Hebrew means the 'God of supplication', and 'Shaphat' means 'judge'. And this tells us that the Lord is a God who can be supplicated, a God to whom we can go to when we are in distress or trouble or in need, and who as Judge of all the earth, will do right (Genesis 18:25). What a God we have. Do you know Him? He did not send His Son into the world to condemn the world, but that the world through Him might be saved (John 3:17). Jesus Christ gave His life upon the cross for you so your sins could be forgiven. Why don't you trust Him for salvation today. He will not turn you away (John 1:12). The Bible does not disclose much information about the character of Naboth. But one thing we are told about him is that he owned a vineyard, which was in Jezreel. Naboth's name in Hebrew means 'fruit' or 'produce', so it is very significant that he should be the owner of a vineyard. As we have already seen with some of the other characters in our story, Naboth seemed to live up to his name, fulfilling his God-given role in life. The name 'Jezreel' is also significant in this story, for its Hebrew translation is 'God will sow'. Now we are not told that Naboth's vineyard was particularly large, or that it was better than any other vineyard in Israel. But its prime location next to the palace of Ahab meant that it constituted an ideal acquisition for the king. Ahab wanted Naboth's vineyard for a garden, and so he offers to give him a better vineyard in exchange for it, or to buy it for a price. But Naboth remains faithful to the Lord in refusing to sell Ahab the inheritance of his fathers (Leviticus 25:23). Ahab is much displeased at this, and when Jezebel finds out the reason for his depression, she concocts a way whereby the king can get his hands on the property. So Jezebel sends letters to the rulers of Jezreel, signed in Ahab's name and sealed with his signet ring, demanding that they proclaim a fast and set Naboth on high among the people. Then two men, 'sons of Belial' or 'children of wickedness', were to sit before Naboth and accuse him of blaspheming God and the king. The penalty for these sins was death by stoning, and so with Naboth out of the way, Ahab would be free to take possession of the vineyard for himself. Of course the townspeople, fearing wicked Ahab more than they did the Lord, were only to happy to do what Jezebel had asked. This story, in dealing with the sin of covetousness, has parallels in the life of King David in the matter of Uriah and Bathsheba. It also has a remarkable parallel with some of the parables of the Old and New Testaments. In the Gospels, the Lord relates a parable about a certain householder that planted a vineyard. He planted a hedge around it, and built a watchtower, and a winepress, and leased it out to tenants, before going on a journey into a far country. And when the time of harvest drew near, he sent his servants to receive the produce of it. But the tenants of the vineyard were greedy and wanted it all for themselves. So they beat the servants and sent them away empty-handed. The owner of the vineyard then sent other servants, but some they wounded and others they killed. At the last he sent them his only son, saying, "They will reverence my son", Mark 12:6. But they said to themselves, "This is the heir; come, let us kill him, and the inheritance shall be ours", Mark 12:7. And so they cast him out of the vineyard and killed him. These stories are like a miniature picture of what God would do in sending His own Son Jesus Christ to die for our sins (John 3:16). The nation of Israel is referred to as God's vineyard many times throughout the Scriptures (Isaiah 5:7). The passage in Isaiah 5 reminds us how God planted the children of Israel in the promised land after He brought them up out of Egypt. But the religious and political leaders of the nation, the 'tenants' of His vineyard, refused to give Him the spiritual fruit of it. Like Ahab, they wanted it all for themselves. So the Lord sent His servants the prophets to them (Jeremiah 7:25), but some they wounded and others they killed. At the last, God sent them His only Son (John 3:16). The Lord Jesus Christ was that 'fruit' in the story of Naboth (Isaiah 53:2, John 15:5). The religious leaders accused Him of blasphemy against God in claiming to be the Son of God (Matthew 23:63-66), and of blasphemy against the king in making Himself the Messiah (Luke 23:2). Pilate knew they had delivered Him out of envy (Mark 15:10), but fearing the people more than he did God, he delivered Him to be crucified (Mark 15:15). And so the Lord Jesus Christ was taken outside the city walls and crucified (Hebrews 13:12). "But he was wounded for our transgressions, he was bruised for our iniquities: the chastisement of our peace was upon him; and with his stripes we are healed", Isaiah 53:5. Ahab later humbled himself before God, and the Lord postponed his judgement. We must also humble ourselves before God and repent of our sins. And those who trust in the Lord Jesus Christ as their Saviour can have their sins completely forgiven. "All we like sheep have gone astray; we have turned every one to his own way; and the LORD hath laid on him the iniquity of us all", Isaiah 53:6. 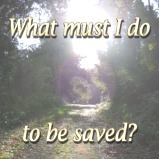 How can we obtain the forgiveness of our sins? The Bible says, "Believe on the Lord Jesus Christ and thou shalt be saved" (Acts 16:31).